The RYA National Sailing scheme is comprised of a series of two-day courses enabling you to progress quickly from beginner to experts in a controlled, safe and enjoyable environment. They are designed to help you enjoy whichever aspect of the sport appeals to you. Following on from the early courses in the National Sailing Scheme, you can choose one of the five advanced modules to suit your sailing interests, eg. 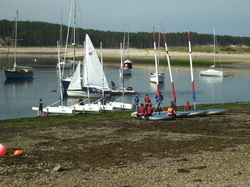 Start Racing, Day Sailing, Seamanship Skills, Sailing with Spinnakers and Performance Sailing. These are available to both adults and young people. Possibly the quickest and easiest way to learn to sail. Small boats are easy to handle and generally light to launch and transport. Learn to sail on your own in a single handed boat or with a crew. We offer the full range of RYA National Sailing courses, shown below. If you are unsure of which level you are at please contact us and one of our instructors will discuss your options with you.